He’s definitely not ready to be the man of the house, but Robbie has definitely started to fill the role of boy of the house. I’m certain it has something to do with a lovely book by the name of The Happiest Toddler on the Block… It was only a few weeks ago that he had four or five tantrums a day, took three hours to go to bed, and generally drove us crazy. However, all of a sudden, he wants to be involved in everything. Wednesday night, we went to the store and I left all the groceries at the top of the stairs. I had gone into the next room to clear some space on the counter. When I turned around, Robbie was lugging a gallon of milk, muttering, “Heavy. QiQi super strong. I got it.” And then he went back for more, rolling the watermelon down the hall and into the kitchen and, eventually, unpacking all of the groceries for me. Later, he went outside with me to take the trash out. And there was a lot of trash. Like, a lot. A Herbie. Seven bags of trash. A bin with a dried and crumbled 60-pound bag of cement. Insulation from a water heater. And a few smaller things. Don’t you know, my darling child tried to take the heaviest bag out for me? Eventually, he settled for the few smaller items, so proud of himself every time he set something on the curb. But maybe having those few really rough months was worth it. After all, now I can appreciate the wonderful little boy he is on his way to becoming even more. And so it begins. The massive disaster that is packing our house. My sister came up to help us for three day, packing our kitchen, dining room, hall closet, and Robbie’s room. That left me with the basement. Oh, the basement. Where I came face-to-face with my cleaning strategy for the past five-and-a-half-years. You know, the old throw-everything-in-a-box-and-put-it-in-the-back-of-the-basement strategy? Except, after so long, there was no more back of the basement. In fact, everything had crept pretty darn close to front of the basement. There were bins upon bins upon bins. And boxes. And bags. And random things on the floor. Baby clothes that brought back memories of my sweet little boy. Christmas decorations from my childhood and my grandmother’s house. Student work samples from my first teaching job eleven years ago. Junk mail from 2006. W-2’s from 2001, 2005, 2006, 2010, and 2011. My birth certificate. Robbie’s birth certificate. You know, the usual stuff you find in a basement. Three bags of baby clothes went to a student who just had a little boy. A carload went to the curb and slowly disappeared over the next several days. A carload went to GoodWill. Four huge boxes of paper were recycled. Oh, and eight large garbage bags were thrown out. Father’s Day meant fishing at the beach for Justin. There wasn’t a lot out there to catch, but he did manage to snare a rare sea creature. The Robfish. 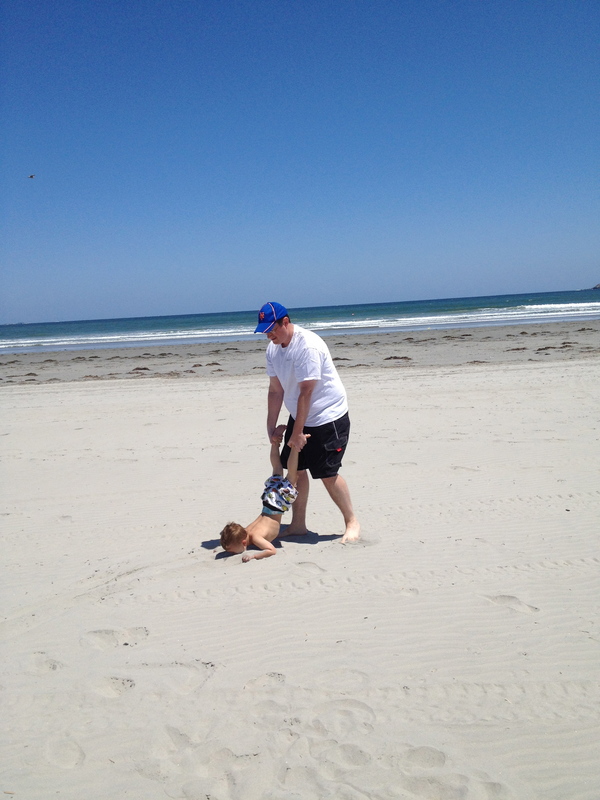 It’s a strange breed, preferring to be dragged around the sand after it is caught. It can be dangerous work, but Justin managed it well. And now, of course, Robbie keeps asking to go fishing again… I don’t think he has any idea what real fishing is. An old friend came into town last weekend, so Justin and I decided he needed to try the best ice cream around. After lunch in Harvard Square and a game of frisbee on Lexington Green, we headed out to Bedford Farm for some ice cream. While we waited in line, Robbie sized up the kids who had already received their ice cream. Within seconds, he was seated on a bench next to three little girls. I looked over just in time to see a glint in Robbie’s eye as he leaned over and kissed the little girl sitting next to him on the arm. Surprised, the only thing I could say was, “Robbie! We don’t kiss girls we don’t know!” The little girl shot off the bench, ran to her mom, and screeched, “Mom! That boy kissed me!” in a voice as disgusted as she could manage. I didn’t know whether to laugh or cry. As we all know, my child has been making me crazy. So crazy that I was finally forced to (gasp!) buy a parenting book. In a moment of weakness, I downloaded The Happiest Toddler on the Block. And. It. Has. Changed. My. Life. It starts off talking about how our children are actually cave people – finally, someone who understands – and I was immediately hooked. The book has helped me diffuse tantrums and learn to talk to Robbie so he actually listens to what I’m staying instead of just hearing blah, blah, blah. So, after that disastrous start, I read a little further into my book and got to the chapter on encouraging “green light” behaviors. It’s pretty typical stuff that you tend to forget in the day-to-day routine of life, but there was one section that really grabbed my attention. It was called “Hand Checks.” Sure this didn’t mean that I could hand check my child when he was doing good things, I read on. The whole process is actually quite simple. When you see your child doing something good, you put a check mark on his hand. Intrigued, I figured I’d give it a shot. Robbie offered a please and thank you unprovoked, so I drew a checkmark on his right hand. A grin spread across his face, and he asked for another one. By the end of the day, he had five checkmarks, and I had a pleasant child who got his toenails clipped without fuss (he has never let me do it while he was awake), helped make dinner, and started to pick up some of his toys. Of course, the ink washed off in the tub, which provided me with a greater opportunity to encourage more good behavior. He brushed his teeth all on his own. He stayed in bed when I asked him to. All for a few checkmarks. Brilliant. I can’t wait to give him more tomorrow. For the past three years, I have desperately wanted to move home. From the moment I first rocked Robbie in the same chair where my mother rocked all three of her children, I wanted to be back there. I wanted Robbie to know his family, to grow up with the same things I had. Catching fireflies (we don’t have them in Arlington – or, if we do, they avoid our backyard). Picnics at Ecton. Swimming in the city pools. But I never thought it was really going to happen. Sure, I’ve been working hard towards moving home for the past six months. Convincing Justin that it will be wonderful. Getting my teaching certification transferred to Kentucky. Applying for jobs. Prematurely looking at houses. But, as time moved on, it felt like things weren’t going to come together. Sure, Justin’s company said he could work from Lexington. But I didn’t have a job, and our house wasn’t selling. And then Monday happened. Last week, I had been unofficially offered a job at Crawford Middle School in Lexington. On Friday I got the official word. Monday, shaking and trying hard not to be emotional about leaving Lawrence, I went to my boss and turned in my letter of resignation from last year. It’s a difficult thing to do; you question whether you’re making the right decision. After all, you don’t have to leave. You want to. After turning in my letter, I officially accepted the position with Fayette County. A few minutes later, one of my students came in. She has been watching Elmo while our house was on the market and told me there had been a family meeting. They wanted to permanently keep the cat. Sure, it’s been nice only having the two. But it wasn’t going to be permanent; and I’ve had Elmo since he was three weeks old. And what kind of person just gives her cat way? However difficult the decision was, I knew Elmo would be happier living with Yerelyn. And so would Justin. On my way home, I shared this information with my mom, who has our cat, Grover, and our dog, Barkley. She said, “You know, if it would help you out, we’d be happy to keep Grover. Tom has grown really attached to her.” Just like that, we were officially a two-cat family. Then, at 6:00, things took another startling turn. Our realtor called: there was an offer. Probably not the offer we wanted, but, after a few hours of counter offers, we came to terms both parties could agree with. All Justin and I could do was look at each other. It was real. It was happening. Slowly, as the events of the day began to sink in, we started talking about our time in our little treehouse. All the wonderful things that had happened there – the birth of our son, acceptance into Boston College for both of us, Robbie’s first Christmas. And the sad things, too. This was the house where the police came to have Justin call the coroner. It is the last home of ours that his mother would ever see. But it’s time to pass the little treehouse on to a new family. After all, there are so many exciting things waiting to happen. I’m not sure when it happened, but Robbie has turned into a very sweet little boy. On Saturday, I had a terrible TMJ flare up – one where my jaw spasmed out of control for nearly thirty minutes. Basically, my jaw chatters and there is nothing I can do to stop it. It’s impossible to talk and incredibly painful. Unfortunately, it happened in the car in full view of Robbie. It was also the first time Justin saw it happen. All of a sudden, in the midst of the pain, I hear a sweet voice from the back seat asking if I’m ok. When he heard me crying, Robbie started to sing “Edelweiss” to me. If I hadn’t already been crying from the pain, I would have from emotion. It was the first time he realized something was wrong and tried to make it better. After he finished singing, Robbie told me he and Justin would get me ice and the ice would make it all better. Robbie comes into our room every night around 3:30. He quietly climbs over Justin, checks to make sure we’re both OK, and snuggles into the bed. And then he rolls over and rubs my back until I fall asleep. I’m not sure what happened to the monster who invaded our lives for the past three months, but I sure do like the sweet boy who replaced him. I just hope he stays. One of my New Year’s resolutions was to run a marathon this year. However, I had no intention of actually doing it. Ever. It just sounded like something I needed to do. 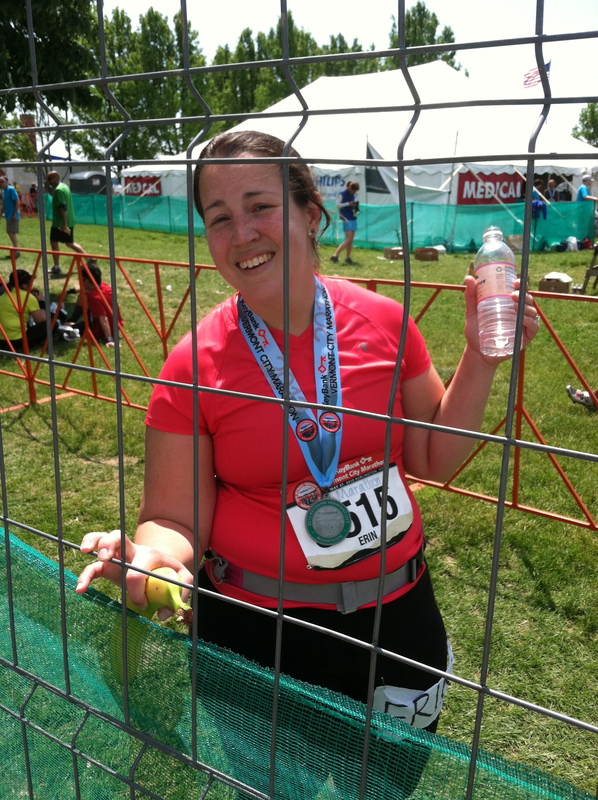 After all, I had run two half marathons and finished a 200-mile relay. But, who in their right mind would actually run 26.2 miles? Turns out, I would. And I did. 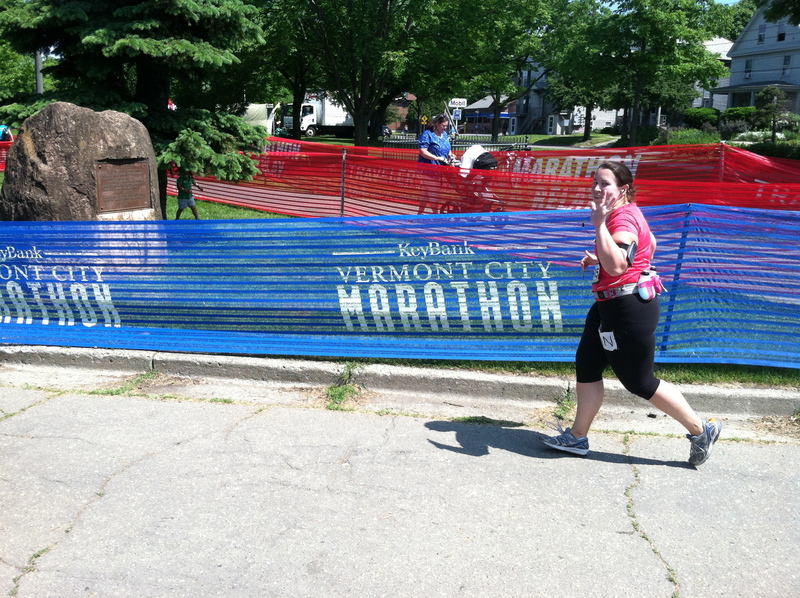 In early April, Justin registered me for the Vermont City Marathon in Burlington. I downloaded Hal Higdon’s novice marathon app and got to work. I still wasn’t sure that I would actually do it. And then, all of a sudden, it was here. Justin showed up four times on the course, proving himself the most supportive husband in the world. Particularly because he ran (full disclosure: walked) the last mile with me. He made an excellent photographer, capturing some of my more fabulous moments. The run was brutal; how could it not be? I hit a pretty big wall around mile 17 and, by mile 22, I was done even trying to run. Somehow, I managed to pick up my battered feet for the last .3 mile to run across the finish line. I stepped across the finish line, hands in the air, grin on my face. I. Had. Done. It. And with that, I got rid of the person I used to be. The person who could barely get off the couch. The person who got winded trying to speed walk. The person who never had any personal fitness goals. And, all of a sudden, I became someone new. A distance runner; a marathon runner. And I can’t wait to do it again – only better. Last Friday, Justin headed to New York with some friends for the day, leaving Robbie and me to our own devices after school. There were no new movies out – our usual date plan – and I couldn’t bear the thought of another night at Chuck E. Cheese. 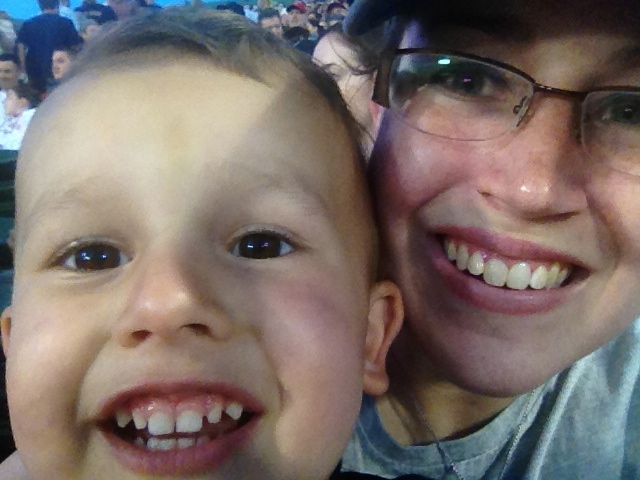 Without really thinking the idea through, I decided to take Robbie to Fenway for a Red Sox game. He’d been before, but not since he was really little. This was the first game that he would actually remember. The first part of our date was bus and train ride, and that alone would have been enough. Especially after I took the wrong train, and we wound up at the Symphony stop on the green line. Eventually, though, we made it to Fenway. Robbie waited patiently in line for his popcorn and Diet Coke before we made our way to our seats. I’d been fortunate enough to get reasonably priced tickets on eBay for our last-minute adventure. Eventually, things took a turn for the worse. Robbie wet through two pairs of pants. He threw bits of popcorn. The crowning moment was when my phone went flying three rows and hit a very upset young woman in the back. 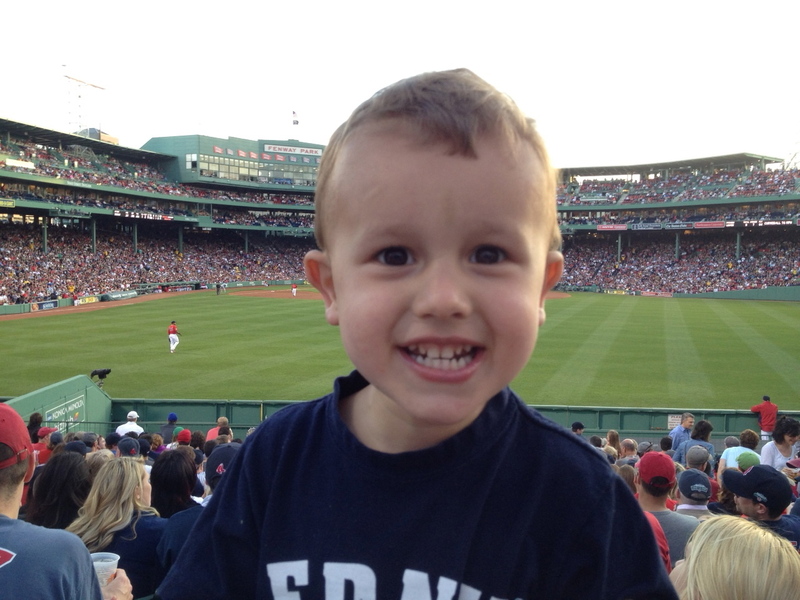 Justin confided in me later that he never would have taken Robbie into Fenway alone. It might not have been the easiest adventure, but I don’t care. He’s still talking about it a week later and cheering on the Red Sox, especially when Justin talks about the Yankees. What more could a girl want? 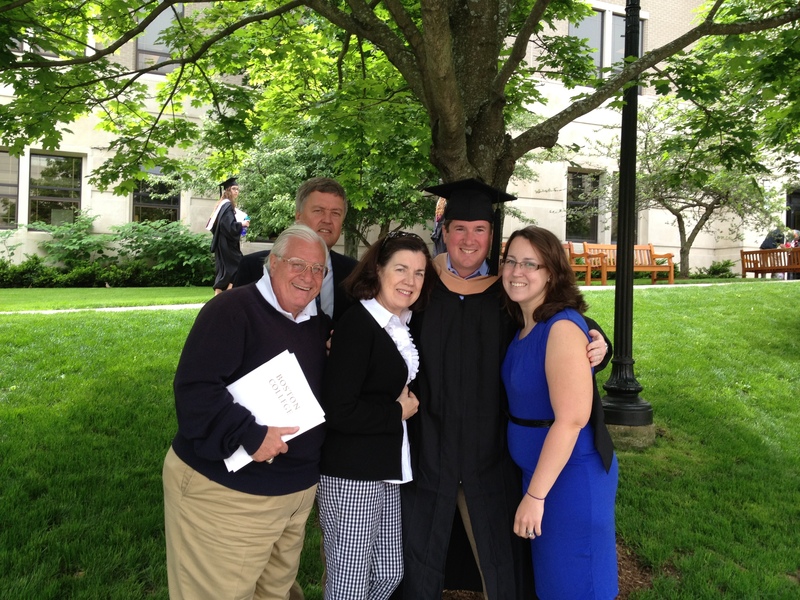 I’m not sure how it happened, but I forgot to congratulate my wonderful husband on graduating from Boston College! He officially finished in December and walked this month. Sitting in the stands watching the ceremony was a little bittersweet. It’s just another sign of us starting to wrap up our lives in Boston, and I had just been in the same position two years ago. And now, Justin and I have closed that chapter. Congratulations, Justin Manna! I am so incredibly proud of you!